After I settled each asset allocation I went searching for the equivalent ETF. Because US ETF market is much bigger and offers an enormous variety of funds compared to Europe I decided only to buy US ETFs. My primary goal was to find ETFs with lowest expense ratio possible, but I also took a peek at market capitalization. Coincident or not, low expense ratios are normally associated with big market caps. In the long run every expense counts. 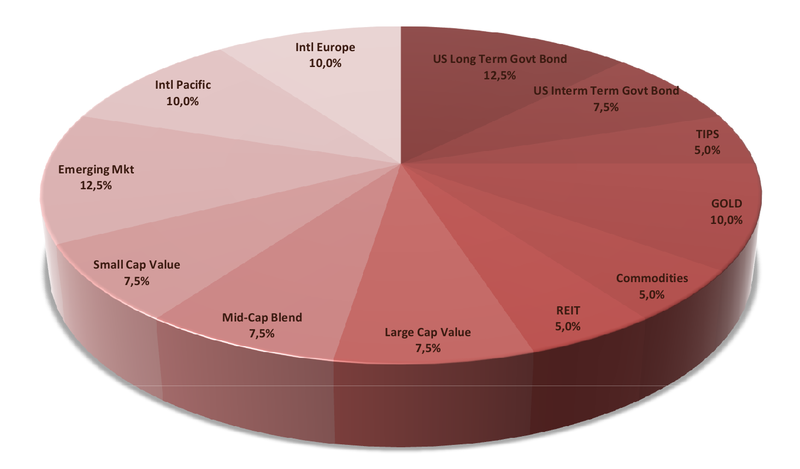 To define what to buy I used an ETF database and through a simple search of categories I quickly gathered an ETF portfolio, with different asset classes and geographical diversification. The expensive ratio is really low with a figure of just 0.17. This means that in a 10 000 usd value portfolio 17 usd will be used in management costs by the ETF issuers. Try to beat this mutual funds! 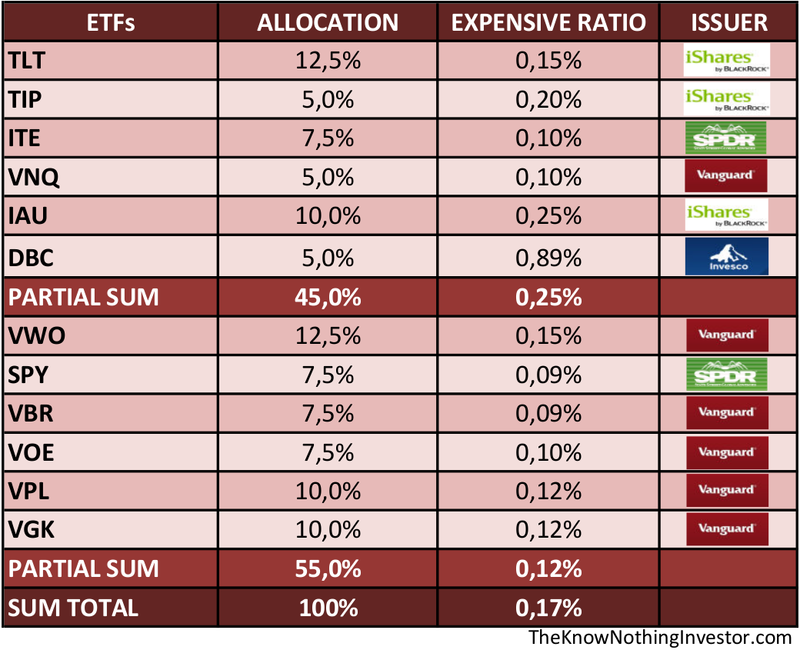 I was also glad to confirm that the Vanguard ETFs were the ones with lower expense ratios, meaning that Mr. John Bogle’s investing philosophy is still nurtured in his company, which sadly isn’t the mainstream policy in financial business. The most expensive ETF is the commodity one, DBC – PowerShares DB Commodity Index Tracking Fund, but this was expectable because of contango effect. There were others cheaper, but I wasn’t very fond of their market caps, so I decided to go with the most valued one. Vanguard also have a cheaper ETF for big american caps instead of SPY, but choosing between them represented less than $0.5 and this allowed me to be exposed to more ETF issuers. It’s also neat to have the benchmark in my portfolio for performance purpose. Another particularity is that instead of having only one ETF for US stocks, normally it’s choose an ETF for small cap value equities because they have better historical returns, I rather divided it three small, medium and big caps. I like the a idea of following a company’s growth, from small to big cap. This time it would be different I would make money. I would use my short term knowledge and market-timing for perfect entries. Knowing that if I failed, time would ill mistakes. Although this time I wouldn’t do that kind of mistakes. I had the money, I knew what ETFs to buy, I was a fresh customer of an US based broker. I had it all. Once again I was so full of myself that I forgot passed lessons and bought all the ETFs in one week and then the market went for a correction. At this point I had identified what type of assets to have, but I didn’t know how much of this or of that should I allocate in my portfolio. Instead of eeny, meeny, miny and moe the assets I started profiling myself as an investor. How much risk could I take, could I handle 30% drawdown pain or what should be my goal about rates of return, were some of the questions. I must admit that a 30% drawdown is scary but I consider myself mentally strong to bear a 20% drawdown for one or two year. On the other hand, I would like to have an annualized rate of return of more than 10% for at least 30 years. If you become greedier you’ll have bigger drawdowns and you’ll never know if you’ll be hit by a black swan event when your portfolio is down by 40% and you need your money back. Stay humble. As I showed in the last two chapters I like to divide the asset classes in two major group, where equity ETFs represent higher returns and non-equity ETFs are smoothers of drawdowns when economy is going down the drain. To determine what percentage of which to allocate I wrote down a checklist of important aspects to consider about me as an investor and my futures perspectives about investment, saving and contracting new debt. To make it clear saving and investing for me are different, saving is money for short-term purpose that I predict that I’ll will be needing it shortly or for some eventuality and investing money is to allocate for a long period to make it grow and to be used in retirement, for instance. Curious or not it gave me almost a typical 60/40 portfolio allocation. Of course if the checklist would turn out with a 80/20 allocation, I would had go with a traditional 60/40 approach, mainly because I’m aiming for long term, trying not to sell for rebalancing and with a slightly conservative approach I feel more comfortable. If you don’t want to bothered with checklists just decide the allocation based in your age, if you are 35 years old put 65% in stock. This approach is commonly accepted. It was time to do some backtest to finally establish individual asset allocation. For this I thought I would need historical data going back at least 30/40 years, mainly because US long-term bonds are in a bull run for the last 30 years and I would like to test my portfolio with US bond behaving differently. That would have represent a ton of work and time consuming, but because of modern times I always google it everything first and for someone searching for a spreadsheet for backtesting, with 40 years of historical asset data with all functions and charts needed to analyse a portfolio for free, that would be the place to look it for. And thanks for all the altruistic people out there sharing knowledge on the internet, because I found it. 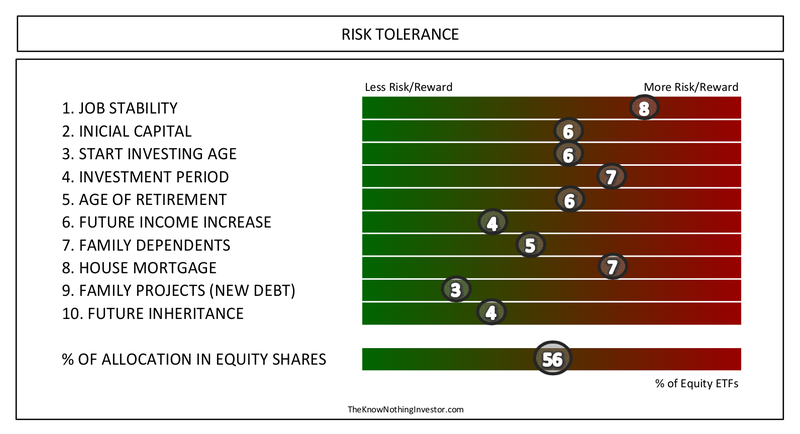 So I started playing with different percentages allocations based on my risk tolerance and where main groups should have an allocation around of 55/45. 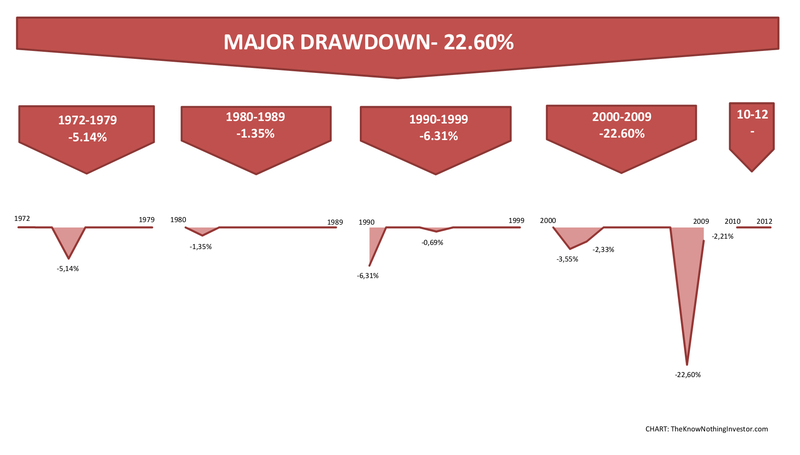 In 2008 was when major drawdown happened. Go figure! Finally I had a close idea of what my geographical diversified portfolio should be. With a compound annual growth return (CAGR) of 12.17% over 40 year and a maximum drawdown of 22.60%, where 55% were allocate in equities and 45% in other asset classes, I was very satisfied to have established a portfolio that met my initial requisites. Of course those 12.17% aren’t taking inflation into account, because with inflation your real CAGR would drop to 7.56%, which is still a great number. Turning $10 000 into almost $200 000 inflation free is really good numbers. It takes 40 years, but those numbers are accessible to everyone, especially for the know-nothing investors with no trading skills, whom through a normal saving account would never achieved those results. 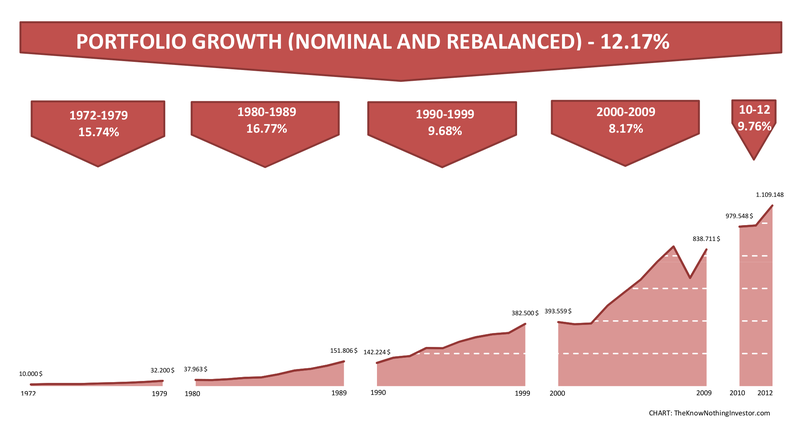 Without rebalancing, the returns would increase, but so drawdowns and in 2008 instead of 23% it would be 44%, which is an enormous figure and not suitable for me.. There is more than one way to skin a cat in the markets and the most important thing is to be comfortable with the way you choose to skin it. Past performances aren’t future performances, but they give an idea of what to expect. Back in 2013 I thought I had found a good balance between risk/return/personal life, almost two years later I’m more convinced of that. Is possible to do better? Sure, much better. Could I do better? Probably, not. At least for now, I’m still eager to learn and to improve. This system is simple and unpretentious, but allows time for my personal life and to study more while having decent returns. It was time to go shopping some ETFs.